Lumbago is also called lower back pain. It's sometimes also called lumbalgia. The word lumbago is an aggregation of the Latin word lumbus (loin) and the Greek word algos (pain), and that takes us right to what it means – pain in the loin. So lumbago indicates lower back pain, and the word lumbago is also still used if the pain radiates to buttocks, legs and thighs. If the pain radiates further, we no longer speak of lumbago but of sciatica. People who suffer from lumbago often have stiff parts in the back as well, there is a clear connection between pain and stiffness. Research shows that stiff parts of the back are also associated with thinner intervertebral discs exactly in those stiff parts. Once you understand what lumbago is and what all it is related to, insight in the treatment is not all that difficult. In practice, many people take pain killers or muscle relaxers – hoping that once the pain and cramps are gone, the problem is gone as well – what do you mean 'fighting the symptoms'? We think this is not the way, although when your back is stiff with tension and pain, relaxing the muscles can be a first step. The next step of course is to fight the actual cause. 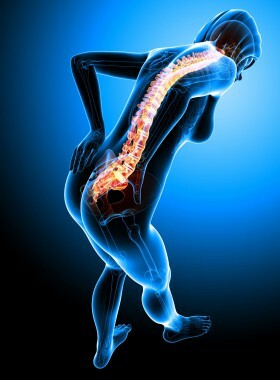 You may already know that on Beatingbackpain.com, we advocate keeping your back in motion, and that we advocate bringing flexibility back to your back by working, amongst other things, on improving the health of your intervertebral discs. Your night's rest is of course important, it is in fact necessary to revitalize your body. But during daytime, it is movement that your body needs. The problem is that if you have a severe attack of lumbago, you are incapable of normal movements. And it is difficult to sleep as well, as every nightly twitch can cause tormenting shoots of pain. So what is there left that yo can do? If you are down with lower back complaints and if there is also stiffness, muscle tension and/or muscle cramp, then the first thing you should do is relax your muscles and 'unlock' everything. Besides that, you must heal your intervertebral discs, so that the flexibility of your whole back increases, because your back must be flexible AND stable to become or stay painless and healthy. I emphasize on flexible AND stable, because it is the core stability on the lowest level in your back that is crucial in preventing that your back snaps or that you suffer from lumbago. For starters, with the exercises in the basic program we will work on relaxation and circulation improvement for the entire back. This will get rid of the tension and enable transportation of nutrients and waste. These exercises also work on activating all muscles that are required for core stability of the back, and we lay a foundation for a natural healthy posture. Lastly with this program we aim to release fascial tensions in your body, which play such an important role in back pains as well. Next, in the 'Guard Your Posture Checklist', we will specifically work on taking away the posture related causes for lumbago complaints. Without any exercising. And with the 'Dutch Decompression Routine', we actively work on the health of the intervertebral discs and, with that, on increasing the flexibility of your entire back. Altogether, the Beatingbackpain Total Program offers a self treatment program that tackles a large variety of lumbago causes, which enables your body to fight your back problems and heal itself from pain. Last but not least, the program also makes sure that the complaints will not return, instead of more and more often. Of course you can also put together your own exercise program. If you do, please take the aforementioned necessary ingredients into account. The right series of moves that increase circulation, improve posture and give your discs a treat. If however you are looking for a proven total program for a low price, then please feel free to visit our order page. Good luck getting rid of your lumbago!